The traditional video arcade—that dark, dank storefront where slackers feed tokens into Ms. Pac-Man—is dead. In its place has risen web2zone, a loftlike temple of interconnected PCs specially designed for the spectacular 3-D graphics of today’s games. 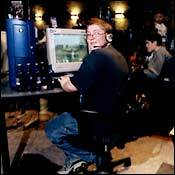 With its 44 networked Pentium IVs and comfy Duo-Back chairs, it’s the perfect place to fritter away a few hours slaughtering terrorists, Nazis, or the 15-year-old sitting next to you (the fiber-optic Net connections let you kill opponents across the room, or in Belgium, for that matter). Don’t worry if the last game you played was Centipede: Staffers can get you started, and the surprisingly friendly regulars—teens and undergrads while the sun is out, employed folks after dark—know all the ins and outs of AK-47s, Mac-10s, and RPGs. Prices start at $6 an hour.